Thomas Sugden was an English professional association footballer who played as a goalkeeper. He played seven matches in the Football League for Burnley in the 1901–02 season. 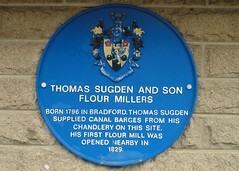 Thomas Sugden and Son flour millers Born 1796 in Bradford, Thomas Sugden supplied canal barges from his chandlery on this site. His first flour mill was opened nearby in 1829.